Castle is now a privately run hotel. Much of Brecon Castle has been destroyed but parts of the Great Hall and the motte survive. The masonry remains form part of the Brecon Castle Hotel with no public access but the exterior of the castle can be viewed from the surrounding roads. The motte is in a private garden with no access. Motte. 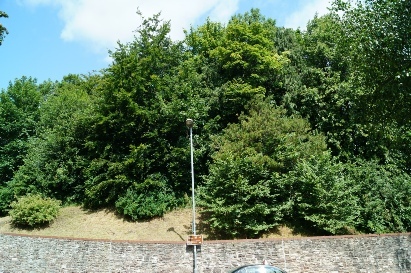 The castle’s motte survives but is covered in trees and on private land with no routine public access. It can be found opposite the Castle Hotel. Notes: The castle is easily found in the centre of town. 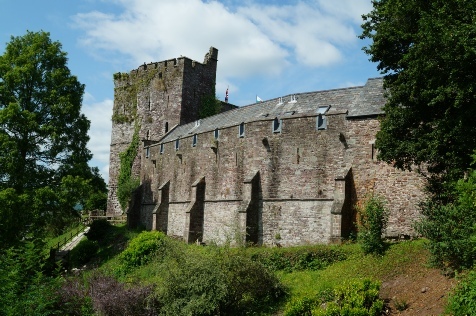 Numerous car parks available but option shown provides a good starting point for a short circular walk across the River Usk and around the castle. Great Hall. The Great Hall is the most substantial surviving part of Brecon Castle. This was built in the thirteenth century with the towers being added later. Controlling a key strategic route into western Wales, Brecon Castle was constructed in the late eleventh century by a Norman Lord who set out to conquer the former Welsh Kingdom of Brycheiniog. The castle changed hands on multiple occasions and was eventually destroyed by Parliamentary forces during the Civil War. 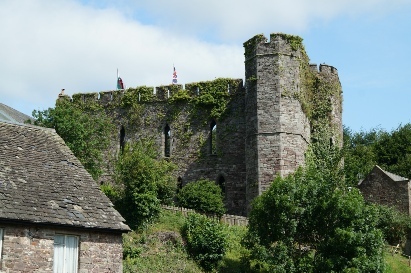 Situated in close proximity to a fording point across the River Usk, over which ran a key east/west arterial route, Brecon has been an important site for thousands of years. Archaeological finds suggest an Iron Age presence near the castle site whilst there was also a significant hillfort, Pen-y-crug, in close proximity. Also nearby was a substantial Roman Fort, enclosing 5 acres, that was established circa-AD 50 as the Imperial armies secured control over the principality. Brecon Castle itself however was raised in the late eleventh century by Bernard de Neufmarche. He was the son of a minor Norman Lord and hailed from Rouen in Normandy. At the time of the Domesday Book (1086), he was not recorded as holding any lands but he certainly came to England shortly after for William II granted him territories in Herefordshire. From here he acquired 'Marcher Lord' status allowing him to act in a quasi-legal capacity in the fractious Welsh border as well as capturing any territory he could. This saw him invade the Welsh Kingdom of Brycheiniog which was eventually carved up into the Lordship of Brecon. Brecon Castle was initially raised circa-1093 as an earth and timber motte-and-bailey fortification. Its strategic location saw it become the administrative centre for the Lordship of Brecon. Concurrently Bernard also founded a Benedictine Priory (on the site of the current Cathedral) and this included granting the church land within the castle. This was in the form of burgages - a plot of land within the town's perimeter - and is unusual for it suggests that the castle bailey doubled as the town. Clearly Brecon started life as a predominantly military community which intrinsically linked with the operation of the site rather than being simply 'camp followers'. Bernard de Neufmarche died in 1125 and his estates passed through his daughter Sybil into the hands of William de Braose, Earl of Hereford. During his family's tenure, work started to rebuild the castle in stone. A shell keep was constructed on top of the motte and two imposing gatehouses were constructed on the east and west sides of the castle. A substantial curtain wall enclosed the entire site and within the Great Hall was completely remodelled. These upgrades were timely for the castle came under repeated attack during the thirteenth century. The first came in 1215 when Llywelyn ap Iorwerth (the Great) allied himself with the Norman-English Barons who were rebelling against King John. The castle was briefly taken by the Welsh Prince and, when he threatened the castle again in 1217, he was brought off by Brecon's burgesses. The castle passed through marriage to the de Bohun family in 1250. Brecon Castle was embroiled in the troubles of the Second Barons War and in 1263 was surrendered to Llywelyn ap Gruffudd (the Last). Recaptured by Prince Edward (later Edward I) in 1265, it was nevertheless returned to Llywelyn following the Treaty of Montgomery (1267). The castle changed hands again in 1273 but Llywelyn's achievements were reversed following the First War of Welsh Independence (1276-7). Allegedly Brecon Castle was retaken without any bloodshed for the Welsh refused to garrison the site preferring to fight a guerrilla war. A few decades of peace followed but the castle was attacked once more in 1294 during the rebellion led by Madog ap Llywelyn. Further upgrades were made in the fourteenth century including construction of the semi-octagonal tower. However, the castle passed into Royal control in the late fourteenth century and remained in Crown ownership until Henry VI granted it to Humphrey Stafford, Duke of Buckingham. He was killed fighting at the Battle of Northampton (1460) and his heir fluctuated his support between the rival houses of York and Lancaster during the Wars of the Roses. He rebelled against Richard III in 1483 (siding with the Bishop of Ely who was his prisoner) and, although his uprising failed, just two years later he was restored to his estates following the Tudor victory at the Battle of Bosworth Field (1485). The new Tudor regime owed its position to Welsh support and accordingly both Henry VII and his successor, Henry VIII, curtailed the power of the Marcher Lords. The importance of Brecon Castle as a key fortress in the March was diminished and, coupled with a devastating fire in 1490, the site went into decline. The execution of Edward Stafford, Duke of Buckingham in 1521 (for treason) saw the Lordship become vacant and was later abolished being replaced with the County of Brecknock. The castle saw its last action during the Civil War when it was besieged by Parliamentary forces in 1645. The fortification was subsequently slighted to prevent further military use and was allowed to drift into ruin although some elements, including the gaol facilities, did continue in use. In the early nineteenth century the castle was acquired by the Morgan family and converted into a hotel and it remains in this role today.